Zinzile Majola, 27-year-old singer of Friends Band, says it felt like a window opening when Mugabe left. "It actually gave us more confidence that things would change from now on, from the way they were, from the way they used to be," Majola says. 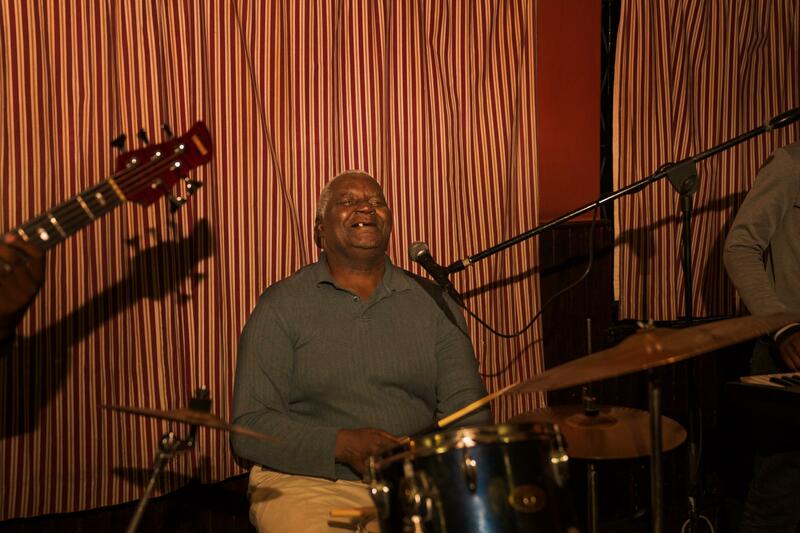 Ebba Chitambo, the 66-year-old co-founder of Wells Fargo, now plays in Friends Band. Friends Band plays a show in Bulawayo, Zimbabwe. In the 1960s and '70s, when the country was still known as Rhodesia, black nationalists fought a bloody war to overthrow white minority rule. At the concert celebrating the country's new independence in 1980, Bob Marley performed his song "Zimbabwe," singing, "Every man got a right to decide his own destiny." Zimbabwean artist Thomas Mapfumo rallied the people of his country with his song, "Tumira Vana Kuhondo," which translates to "Mothers Send Your Children to War." And Zimbabwean psychedelic rock band Wells Fargo had a hit with a song called, "Watch Out." It made the band famous, but it also got its members into trouble. "We had to sit down and change the lyrics to soften them up a bit," Wells Fargo co-founder Ebba Chitambo, now 66, says with a broad smile and close-cropped white hair. The first version of the song was banned on the radio. "The chorus was straight and direct: 'Watch out, freedom is coming,'" Chitambo says. "So, police came to one of our gigs and knocked us around. We had to change it to, 'Watch out, big storm is coming.'" That was enough to keep the authorities happy, even if everyone knew the "big storm" was freedom. But the joy of a free Zimbabwe faded as President Robert Mugabe cracked down on his opponents. Musicians who had sung songs of freedom realized that they were living under a different kind of oppression. Now, Zimbabwe is in the midst of another transformation. In November, Mugabe was forced from office after 37 years. Zimbabweans are preparing for their first elections without him July 30. His successor, Emmerson Mnangagwa, has pledged the vote will be free and fair. Though many in Zimbabwe are skeptical of that promise, the country is experiencing an openness and freedom of expression that it hasn't known in decades. In this consequential moment, Chitambo is making music again. He has a new outfit, called Friends Band. 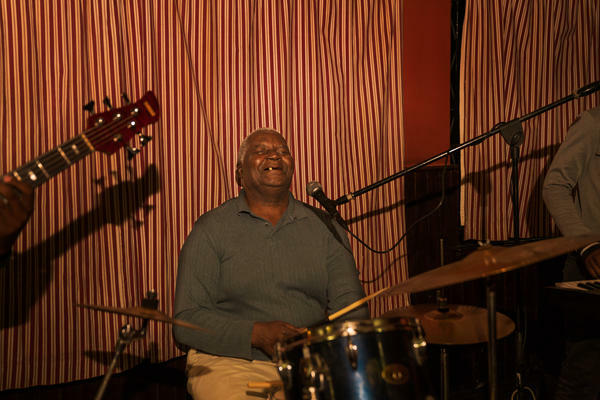 The group mostly plays covers — they are much less famous than Wells Fargo was — and nearly all of the musicians are about 40 years younger than Chitambo. They have only ever known a Zimbabwe ruled by Mugabe. 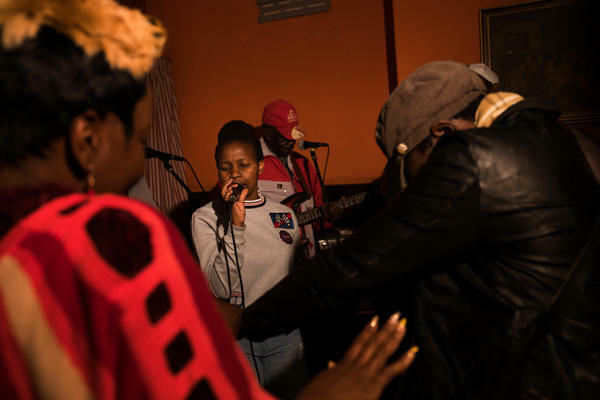 The group sits around a table at a hotel bar in the city of Bulawayo, Zimbabwe, before a gig and the younger musicians have questions for Chitambo about making music in politically charged times. Bassist David Mabhena, 23, is the youngest in the band. He asks Chitambo if he should sing about the changes in their country and make songs that "touch the people's hearts." Chitambo replies that he should write about the reality he's dealing with. "Unless you want to write, 'Kiss me, kiss me baby,' which I know you don't want." This election will be the first Mabhena has ever voted in. "I feel like it's now my time to make a change," he says. Friends Band's 27-year-old singer Zinzile Majola says it felt like a window opened when Mugabe left. "It actually gave us more confidence that things would change from now on, from the way they were, from the way they used to be," Majola says. Chitambo says his younger band mates remind him of how he was at their age. "Listening to their ideas and all that, it reminds me of the days way back in time," he says. And just as Wells Fargo sang about freedom coming at the birth of Zimbabwe independence, Mabhena says he wants to write a song about the better Zimbabwe he hopes is coming after this month's election. "When I grew up, I had people promising us that things would change, but things go from bad to worse," he says. "The song I will write about is a song believing change is near and there is hope." Music and politics have always been intertwined, whether the song is "Yankee Doodle" or "A Change Is Gonna Come." This week, I've been reporting on a political transformation in Zimbabwe. Robert Mugabe was forced from office in November. He had ruled as an autocrat for decades. On July 30, Zimbabwe will have an election, perhaps the first free and fair one in decades. So this is a rare moment of openness and free expression, and politics in Zimbabwe has a soundtrack, too. UNIDENTIFIED SINGERS #1: (Singing) Zimbabwe. SHAPIRO: Back when the country was still known as Rhodesia, black nationalists here fought a bloody war to overthrow white minority rule. And in 1980, Zimbabwe became an independent country where every adult citizen could cast a ballot. In the song "Zimbabwe" Bob Marley sang, every man got a right to decide his own destiny. UNIDENTIFIED SINGERS #1: (Singing) We going to fight. MARLEY: (Singing) We's going to fight. MARLEY: (Singing) Fight for our rights. SHAPIRO: Zimbabwean artist Thomas Mapfumo sang about the fight for independence. The title of this song translates to "Mothers Send Your Children To War." THOMAS MAPFUMO: (Singing in foreign language). UNIDENTIFIED SINGERS #2: (Singing in foreign language). SHAPIRO: And a Zimbabwean psychedelic rock band called Wells Fargo had a big hit with this song, "Watch Out!" WELLS FARGO: (Singing) Watch out. Big storm is coming. There's thunder and lightning. You better hold on. EBBA CHITAMBO: We started being politically conscience, and we tried to change our music to go with the times, like, motivate the people. SHAPIRO: Today, Ebba Chitambo is 66 years old. When he was in his 20s and his country was at war, he fought with music. Ebba was the co-founder and drummer of Wells Fargo. SHAPIRO: He says guerilla independence fighters he used to listen to this song in the bush. It made the band famous and also got them in a lot of trouble. CHITAMBO: The first version we recorded was banned from radio. CHITAMBO: Yeah. But the people liked it 'cause we used to play it live. And we had to sit down and change the lyrics to, like, soften them up a bit but still with the same meaning. SHAPIRO: What were the words to "Watch Out!" before you changed them and after? CHITAMBO: The chorus was straight and direct. Watch out; freedom is coming. So police came to one of our gigs and knocked us around. We had to change to, watch out; big storm is coming. SHAPIRO: (Laughter) ...Even if everybody knew that the big storm was freedom. SHAPIRO: And so if you perform today, what will you sing? CHITAMBO: Big storm is coming. SHAPIRO: He hasn't sung freedom in so long. He just got used to it the other way. The joy of a free Zimbabwe faded when the new president, Robert Mugabe, cracked down on his opponents. The musicians who had sung songs of freedom realize that they were living under a different kind of oppression. 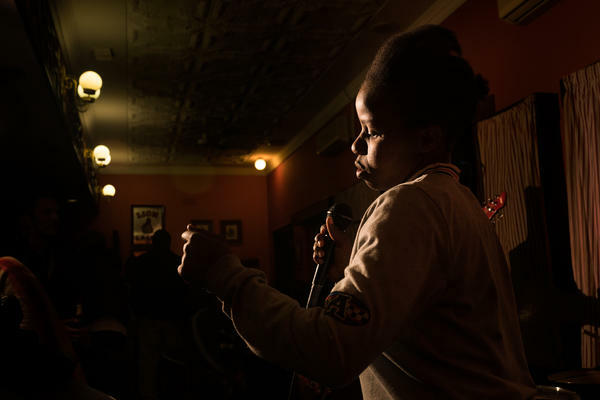 SHAPIRO: When I met Ebba Chitambo a few weeks ago in the city of Bulawayo, his new band was getting ready to play a Friday night gig at a hotel bar. This group is called Friends Band. They're not famous like Wells Fargo. They mostly play covers. And most of the other musicians are about 40 years younger than Ebba. They've only ever known a Zimbabwe that was ruled by Robert Mugabe. The 27-year-old singer Zinzile Majola says when Mugabe left, it felt like a window opening. ZINZILE MAJOLA: Actually gave us, you know, more confidence that at least maybe things will change from now on, you know, from the way they were, they used to be. SHAPIRO: Bassist David Mabhena is the youngest in the band. He's 23. This is the first election he will ever vote in. DAVID MABHENA: I feel like it's not my time to make a change by going and voting. SHAPIRO: Ebba, when you hear these young people in their 20s talk, does it remind you of how you felt? CHITAMBO: It does. It does a lot. And listening to the ideas and all that reminds me of days way back in time. SHAPIRO: When we gathered the band around the microphones, the younger ones had some questions for Ebba. And I got the impression they hadn't really asked him about his past before. MABHENA: So the advice - what advice would you give to us? Should we take the things that are happening around and then record songs so that it will touch the people's hearts? CHITAMBO: ...Unless if you want write, kiss me; kiss me, baby; what; what, which I know you don't want. SHAPIRO: What would you write a song about if you were going to write about what's happening now? MABHENA: Believing for a better Zimbabwe after the elections. I'm 23 years old now. But when I grew up, I had people promising us that things would change. But things could go from bad to worse. So a song I'll write about is a song believing that change is near, and there is hope. SHAPIRO: Soon it was time for Friends Band to get ready for their set at the pub in the Cresta Churchill Hotel. The crowd trickled in. People ordered beers. Soon everyone was dancing. SHAPIRO: And after about five songs, the singer handed over lead vocal duties to the white-haired drummer in the back. SHAPIRO: With a big grin, the man who has sung his way through two transformations in Zimbabwe sang these lyrics. CHITAMBO: (Singing) Watch out. Freedom is coming. There's thunder and lightning. SHAPIRO: Watch out. Freedom's coming. CHITAMBO: (Singing) You better hold on. Transcript provided by NPR, Copyright NPR.